Despite this history, Inocente’s eyes envision a world transformed…where buildings drip in yellow and orange, where pink and turquoise planets twinkle with rescued dreams, and one-eyed childlike creatures play amongst loved babies and purple clouds. Inocente’s family history is slowly revealed through her paintings. 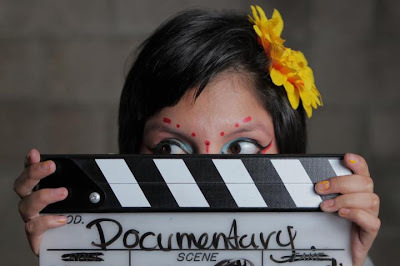 Told entirely in her own words, we come to Inocente’s story as she realizes her life is at a turning point, and for the first time, she decides to take control of her own destiny. Irreverent, flawed and funny, she’s now channeling her irrepressible personality into a future she controls. Her talent has finally been noticed, and if she can create a body of work in time, she has an opportunity to put on her first art show. Meanwhile, her family life is at a tense impasse – – if she legally emancipates herself from her mother to strike out on her own, she’ll risk placing her brothers in foster care, but to stay is unbearable. INOCENTE is both a timeless story about the transformative power of art and a timely snapshot of the new face of homelessness in America, children. Neither sentimental nor sensational, INOCENTE will immerse you in the very real, day-to-day existence of a young girl who is battling a war that we rarely see. The challenges are staggering, but the hope in Inocente’s story proves that the hand she has been dealt does not define her, her dreams do.